Playing miniature tabletop wargames like Warhammer or Warmachine without any terrain or obstacles on the game board is a little bit like getting ice cream on a cold winter day. Sure, everything that you like about it is there, but it just isn’t very satisfying. Miniature games are more than anything a game of army selection and strategy, and you really need to have both to be successful. You could have the deadliest, most powerful characters and troops in the game, but if you don’t know how to use them a lesser army with a better game strategy will beat you every time. And when you add some terrain into the mix, a good strategist could wipe the table with you without even trying. For such an important and potentially game winning part of the game, most miniature wargamers don’t put nearly as much effort into their terrain pieces as they do their armies. It isn’t uncommon to see makeshift buildings constructed with taped together cereal boxes or random bottles and cans strewn around the game board. While that gets the job done, it certainly isn’t as much fun as a well thought out and fully painted piece of terrain. But when the army that you’re using can cost you into the hundreds of dollars, it’s hard to justify spending just as much on a nice piece of terrain. That’s where 3D printing enters the picture, because I can’t think of an invention more suited to a miniature wargamer’s needs than a 3D printer. There are some amazing pieces of terrain and scenery that can be printed, assembled and painted for pennies on the dollar compared to terrain that can be purchased. Sadly, a lot of gamers don’t even know how much is actually out there, or think that they need a 3D printer to get it. In an age of 3D Hubs, Shapeways and i.materialise, not having a 3D printer just isn’t that big of a deal anymore. I had to start off this list with a bang, and you’re not going to get much more of a wow factor than pulling this bad boy out and putting in on a game board. The Omnisphere is a huge piece of terrain that has a removable roof so figures can actually enter it, and continue the game indoors. This is a perfect feature terrain piece for skirmish games, capture the flag or king of the hill type variants. The best pieces of terrain are those than can serve multiple purposes. You could use this awesome gateway for tabletop RPGs, as a random piece of terrain for wargames, as an objective marker or even create a rule variant that allows players to use it to transport to other parts of the game board. There is a lot of fun to be had with something like this, or you could just print it up and paint it as a display piece. The scale is for 18mm miniatures, so it may need to be bumped up in scale for 28mm games, but even at its original size it’s pretty large. The designer even designed a “vortex” piece that can be inserted into the doorway. You could print it in standard filament and paint it, or even print it in a transparent material and light it from behind. Back when I ran a game store and played regularly, one of my favorite game variants was what we called “bottleneck”. Essentially, the board was divided in half, and the only way to get from one side to the other was either a break in an impassable wall, or a bridge. Sadly, we didn’t have an actual bridge, so we typically used a piece of road or something. Just seeing this beautiful bridge model makes we want to start gaming again. The bridge was actually designed so it could easily be customized to whatever length is needed. Extra middle inserts can be 3D printed, so it could be a short bridge or an especially long bridge that would be great for a skirmish game. This would also make a great addition to a display board. Not every piece of terrain can be a show stopper, but you always want your terrain to be cool and interesting. If you’re playing a science fiction-themed game, then having a few of these generators laying around is going to spice up any game. You could use them for cover, to prevent charges or as objective markers. You could even give them special rules, like say a damage threshold that causes them to explode if they take too much fire, potentially damaging any models hiding behind them. While this model is made up of about sixteen individual parts, don’t worry, it isn’t that complicated of a project. None of the parts need to print with any supports, and it should glue together pretty easily. While terrain used as obstacles is always fun, and makes for a great game, terrain that can be interacted with is so much better. Being able to move figures into something like these castle ruins makes for some great skirmish or smaller point games, and is even good for an RPG adventure. The model is pretty big, so depending on the size of your printing bed it may need to be chopped into a few pieces. Or it can even be remixed and turned into several different pieces of terrain. There is a lot to work with here. While a lot of players like to just put an army on the table and try to kill each other, I’ve always preferred games that had objectives and restrictions. I think the real challenge of a strategy game is in how well you adapt your army or battle group to the game rules and terrain restrictions. One of my favorite game variants, that almost no one else liked, was what we called “pathways”. We used a modular road system to create a large, winding path all over the board and figures were restricted to those paths throughout the game. There was usually an objective that needed to be reached or found, adding an extra layer of strategy, especially when the urge is to always kill first and ask questions later. This road system is at a smaller scale than 28mm, but it is still large enough for individual figures. It can also be bumped up in size to accommodate larger figures and vehicles, but it really depends on what scale you’re playing at and what you want to use them for. With four different base pieces, you can print out as many sections as you want and create a road as simple or complex as you want. When making up a nice, permanent game board, there is nothing better than adding a bit of character to it. These great terrain pieces can be glued onto a board and painted with everything else, adding some nice decorative touches, or even the possibility of using them as objective markers or functional terrain. There are three different options, including blast doors, a sewer grate andr round floor hatch. Each is a separate model, so you can 3D print as many as you need. They could even be remixed and used for figure bases, display boards or put onto a wall piece and used on buildings or bunkers. Here is another great piece of interactive terrain that can be used as a simple obstacle, or as a place for individual figures to hide and fight. It’s perfect for smaller-scale or skirmish games, and would make a great set piece for a tabletop RPG. As with the castle ruins, the model can also be cut up into smaller sections and pretty easily remixed into different types of terrain. The great thing about 3D models is they are a lot easier to modify than physical objects and can basically be digitally kitbashed without the risk of ruining the model, or making too much of a mess. I love these little teleporter pads. 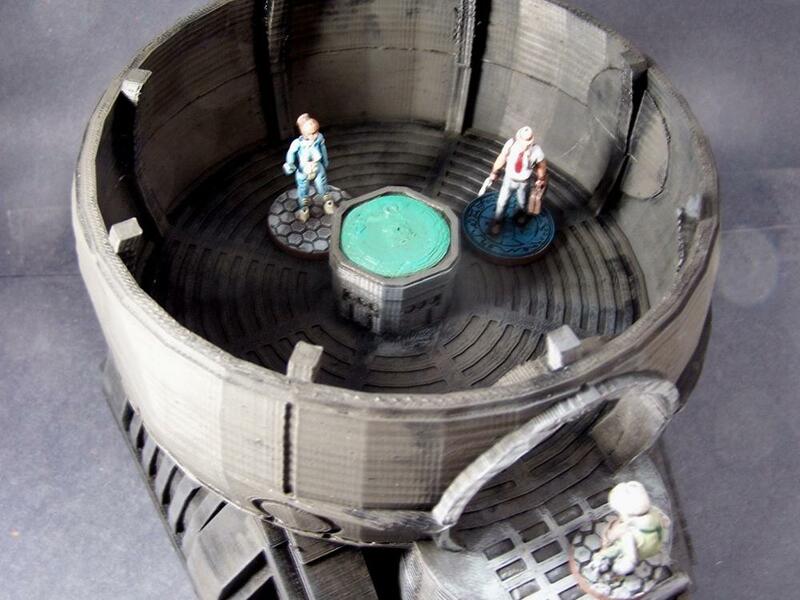 Not only would they make a great piece of background terrain, but I love the idea of adding an actual teleporting rule to them that allows any model who steps on the pad to instantly be teleported to the matching teleporter. It’s a great way to add some really fun rules to a game. You could actually divide up a game board and make it so the only way to get from one section to the other is by using the teleporters. It might even be fun to print out a few of them and have a random element that requires players to roll a dice, which determines what pad they get transported to. These are made to work perfectly for a 28mm miniature figure, but the model seems simple enough that it could even be sized up a little bit if you’re playing at a larger scale, or want to be able to teleport larger figures. And of course I needed to end this list on a bang as well, and these Vctorian-style building are simply amazing.They are incredibly detailed, can be used for all types of games, or even just painted up for an amazing display model. Both the house and the office building can have extra floors added to the center of the model, and I don’t see why some of the pieces from both sets can’t be mixed together to make brand new buildings. With just these two 3D models it is possible to assemble an entire city of buildings. The parts are all made with notches that will hold the different floors together so they can be taken apart and put back together again. Or you could just glue all the pieces together permanently, it really depends on how you want to use the models. What’s great is with a few bits and some creativity, these builds can be adapted to virtually any tabletop game in any era. Some sci fi bits can be added, or some fantasy parts, or even some creepy skulls and creatures can be added for a horror game. It would also be easy to add some battle damage, some rubble and board up the windows to really make them look like they are buildings in the middle of a warzone. So there you go, the ten coolest pieces of terrain that I could find. I tried to keep this list down to things that are either just awesome models, or could have some fun rules attached to them to spice up a boring game. But there is tons of great terrain and scenery available, just be prepared to get lost down the Thingiverse hole for a few hours looking at all of it. I would love to see any 3D printed terrain that you’ve made for your own game tables, or your versions of anything that I’ve featured on my list. You can feel free to email me pictures, or just give me a nice Tweet @SJGrunewald and show me what you’ve got. Happy gaming!